London more and more is for cyclists. We now have the London bikes for hire, which even I have taken to riding. This Sunday will be the skyride where many of London streets will be for bikes only. On the last Friday of each month there is the critical mass ride. Wheelchairs, skateboarders, cyclists all meet at Southbank by Waterloo bridge and ride en mass. Hahaha. Her top and shorts are also striped with black and white. I bet she turns a few heads! It's not just the bicycle, but the girl is all like a zebra. Her legs, the shirt, the helmet! Very funny!!! hahaha! She's great -surprised the bike isn't black. Ride en mass, vive la cyclists (and the zebra)! Yay! London has some very good ideas! 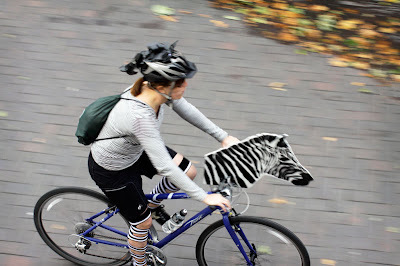 This rider definitely loves zebras and stripes! But biking in a big city is a bit dangerous, so be careful!! Great bike with a coordinated fashion statement. Reminds me of the Copenhagen Cycle Chic blog. This is wonderful, Mo. Can I use it somewhere, please? My hubby is nuts on cycling and I'm thinking it may do for him in some way. I bet her road sense is as good as a Zebra's as well!